NBC announced today that the upcoming seventh season of Parks and Recreation would be the sitcom’s last. Though the series receives awards and critical attention, it’s struggled in the ratings. The most recent season drew a 1.2 rating in the 18-49 demographic with 2.94 million viewers. That’s down by 29% in the demo year-to-year. 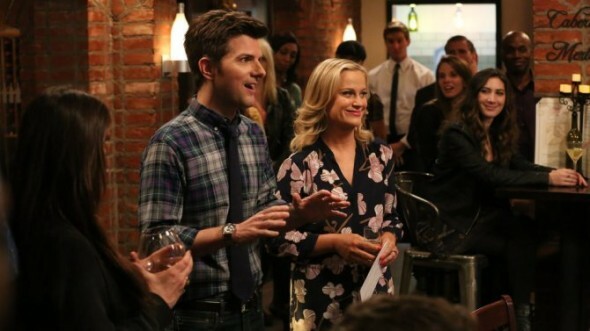 Parks and Recreation will return mid-season with an as-yet unspecified number of episodes. The two most recent seasons have had 22 installments apiece. What do you think? Are you a fan of this series? Are you sorry that it’s ending or is it the right time? Has it gone on too long? I REALLY enjoy this show. I wish someone like Netflix, Amazon Video or HULU would pick it up and give it another chance. The Casting is Spot On, GREAT writers, I don’t get why the shows ratings didn’t grow. I guess Chris Pratt becoming the overnight Juggernaut he has become thanks to Marvel (more power to him BTW) might be a HUGE obstacle, going forward. Though, I think it could be done, if he wanted too. It is the right time for the show to end. Prolonging it on a streaming service would only lower the quality. Everyone is leaving, you don’t think they could possibly keep up with 7 people scattered across the nation, who almost never interact, do you? While I am really sad the see the show end, i’m glad the show ended while it was on top, and they let the show end on its own terms. As I said, prolonging it wouldn’t be healthy for the show, and would tarnish its legacy. i’ve no problem with this….it’s had a good run and there’s enough time that we’ll get a final season and closure…. Please let P&P (parks and recreation ) stay on the air I love the show !!!!!!!!!!!!!!!!!! A charming and quirky show. I have watched it from the beginning. If you aren’t a fan, go back to the beginning and give it a try. Please and thank you. How Parks and Rec lasted six years baffles me. A tremendously poor comedy.